Steep drop-offs beckon just off Kona’s coast, the dominion of pelagic beasts—marlin and billfish some topping 1,000 lbs. Most journeys to catch one begin the 262-slip marina at Honokohau Harbor, just before the entrance to Kaloko-Honokohau National Historic Park. 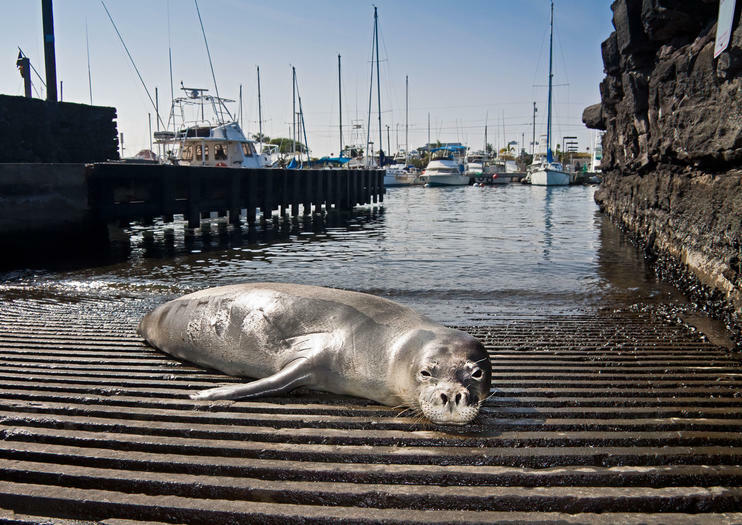 Nearly all of Kailua-Kona’s fishermen, independent sportfish tour operators as well as charter boats departing for scuba sites and popular manta and dolphin snorkeling adventures dock and depart from Honokohau Harbor. The full-service marina also sports two noteworthy restaurants: Harbor House, a burger and beer joint with views of vessels from their open-air dining room, and Bite Me Fish Market Bar & Grill serving seafood delivered direct from the ocean to their door. ATMs, two full service restroom blocks with hot showers and a convenience store for snacks and sundries round out the facilities here. Just behind the marina proper, a snaking road ends at a lava rock parking lot with a trail leading to a small beach with decent snorkeling and popular with area dog owners. Harbor offices are located at 74-380 Kealakehe Parkway and a large sign announces the entrance between mile marker 97 and 98 from Highway 19—it’s three miles north of town and five miles south of the Airport. The Charter Desk, located above the marina’s fuel dock, sells spots on 60 sportfishing boats—expect to pay between $450 and $600 for a half day or $750 and $3,500 for an entire boat’s full-day charter. Most Pacific blue marlin, the big catch here, are reeled in between June and August. Tickets for most other excursions are available from booths in Kailua town. Many popular tourist activities include transport from area hotels or central locations; if they don’t, you’ll need a rental car or taxi to reach the harbor. Note: Restaurants here close between 7 and 9 p.m. Spend six hours sport fishing off the coast of Kona with this private charter out to sea. You'll be joined by an expert crew who can teach you all about angling and fishing techniques as you fish for ono, spearfish, bigeye tuna and striped marlin. Alternatively, you can spend your time snorkeling and swimming in the cool waters off shore. Fish for local species off the coast of Kona during this half-day charter. Get as little or as much help as you wish angling for marlin, tuna, and other smaller game on request. The local captain will take you to the best possible fishing spots and you'll be using top-of-the-line equipment, which gives you the best possible chance to land your prize vish. Charter a private boat and set out to sail with this four-hour private excursion from Kona. You'll have the chance to fish for marlin, tuna, and mahi-mahi using on-board equipment with the support and guidance of an expert captain and crew. Alternatively, you can simply use your time at sea to relax, sunbathe, swim, and snorkel. The Kona coastline is an aquatic playground that's filled with possibility, whether it's snorkeling with manta rays, searching for dolphins, or watching whales in winter. For an exclusive, comfortable, and private way to explore the Kona coast, this rugged, catamaran-style boat is perfect for small group excursions—since the itinerary and activities are completely catered to only you and your group. Along with a professional, knowledgeable captain who can recommend fun-filled activities, experience a private charter in Kona that you and a group of up to 24 people are sure to never forget. Go on a half-day sport fishing excursion on the Big Island. This large-group charter is led by a knowledgeable captain and crew equipped with all the gear you’ll need to reel in yellow fin tuna, big eye tuna, striped marlin, ono, spearfish, or mahi-mahi. Enjoy a fun and relaxing outing that’s perfect for the whole family—even those who just kick back on the deck and soak up the sun. Go on a whale-watching adventure on this 2.5-hour cruise in Kailua-Kona. Board a 48-foot (15-meter) Delta boat in Honokohau Harbor, and set sail on the water to try and spot whales in their natural habitat. Keep your eyes peeled for humpback whales, pilot whales, and false killer whales, which all might make an appearance during your cruise. Sport fishing fanatics and those who want to learn won't want to miss this four-hour, family-friendly fishing boat excursion off the coast of Kona. You'll not only get a chance to learn fishing techniques and try your hand at catching local fish, but you'll also learn about local history and culture. Spend the day out on the water off the Kona Coast on this 6-hour, private, large-group boating and sport-fishing excursion. Learn how to fish like a pro, as the captain and crew offer tips and techniques to catching the big one. The waters off the Big Island are swimming with blue marlin, striped marlin, bigeye tuna, ono and spearfish, among many others. Sit on the boat, fishing or just relaxing, and take in the deep-blue view. Learn how to fish like a pro, whether you're a beginner or already an expert angler, on this private large-group 6-hour charter excursion off the Kona Coast. Get some fishing and angling techniques from the friendly captain and crew and then cast your line out hoping to catch the big one. Snag a bigeye tuna or mahimahi or even a blue marlin and be the envy of the boat. Or just sit back and enjoy the shimmering blue sea on this relaxing half-day excursion off the Big Island.